What is the KeepTouch app? How do I install and configure the app on my Android device? What to do when someone requests your location? How do I manage my permissions? How do I make myself invisible to everyone? How do I request locations? The KeepTouch app enables Android users to locate friends and family members throughout the world by sharing SMS geolocation messages. 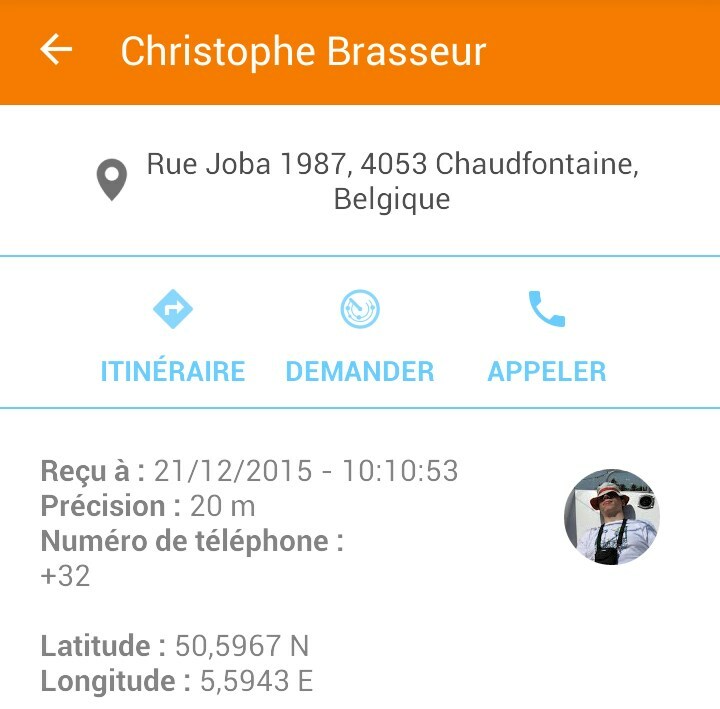 Easily find the geographic locations of multiple friends or coworkers, to give you a meet-up point. Say goodbye to long phone conversations, trying to explain where you are! Send your geolocation if you have a problem on the highway, or on a hike, so your family can come to your assistance. They can launch GPS navigation in Google Maps from the KeepTouch app to find you. You can quickly manage your geolocation permissions with all your friends, by defining a desired response method for each of them: always, request confirmation, or never. If necessary, you can switch to invisible mode in the blink of an eye. 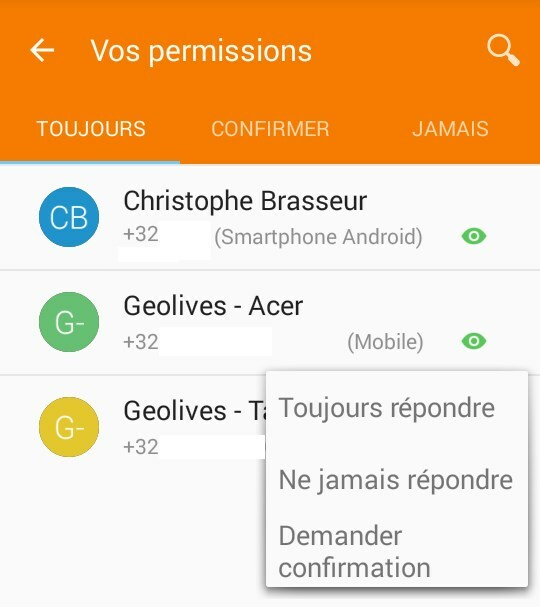 The use of SMS geolocation messages directly between you and your contacts, with no middle-man, protects your privacy. This communication method also conserves battery life for your device, since GPS is not activated until needed. 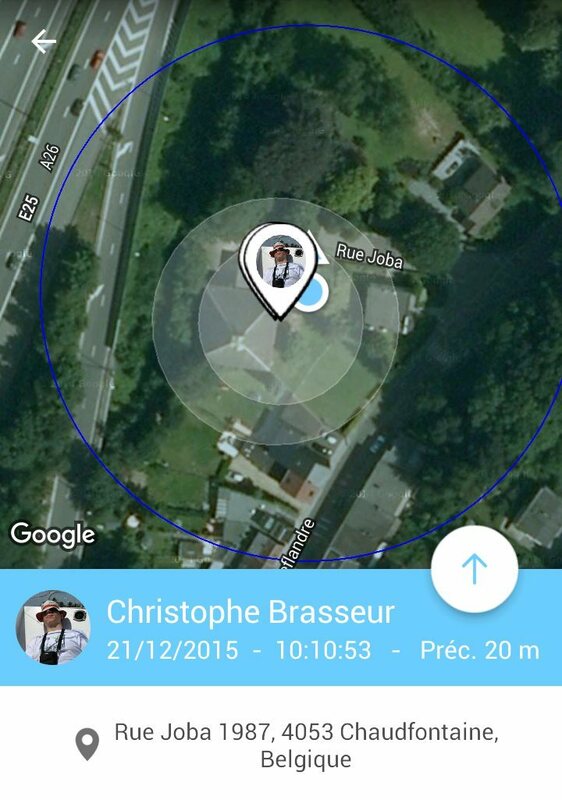 The KeepTouch app is a personal geolocation and tracking solution. 1) Download and install the app for free from the Google Play Store. 2) Launch the app for the first time by clicking on the icon. 3) You are ready to send your location or request locations. 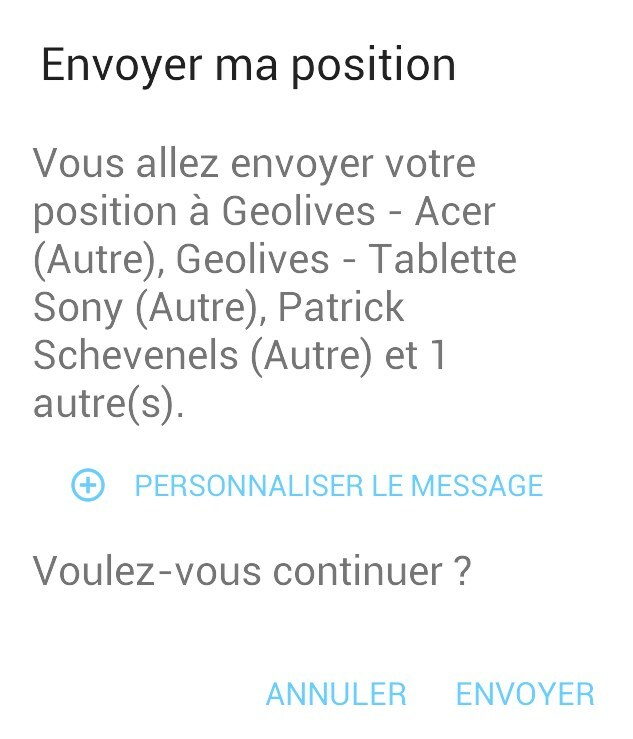 When someone requests your location for the first time, a notification will appear on your Android device's notification bar. 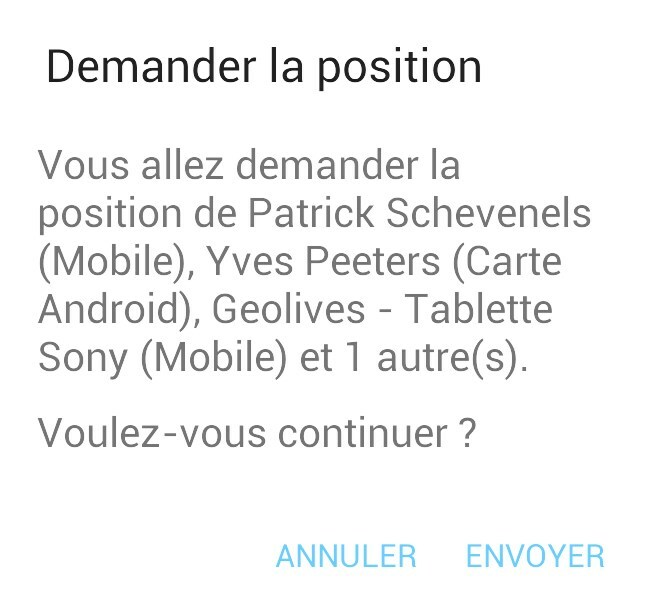 For people who are not on the contacts list of your Android device, the options, "Always" and "Never" do not appear. 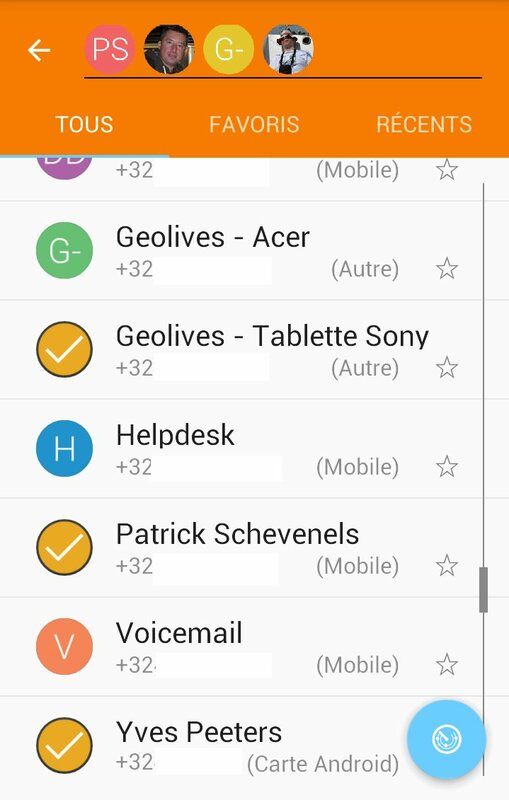 If you want these options to appear, add the person to the contacts list for your device. You can change your selections at any time in the app, by hitting the action button in the lower right corner and selecting "Your permissions". - Always: People you have decided to always authorize sending your location to. - Never: People you have decided to never authorize sending your location to. To change your selection for a person, click on the corresponding entry on the list. To protect your privacy, you may choose to temporarily disable sending your location (even to people who are normally authorized). To do this, click on this button: In the upper right corner, then select "Do not respond". Don't forget to change this back when you want to be locatable again. 1) Click on the action button in the lower right corner and select "Send your location"
2) Select the contacts you want to send your location to, then hit the button in the lower right corner. 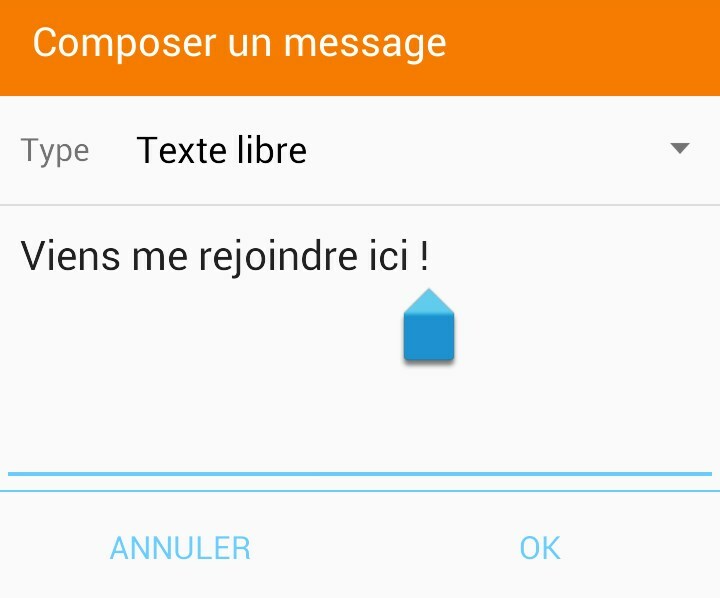 3) Personalize the message if you want to (with a preset message or free text) then confirm sending. 1) Make sure the people you are requesting locations from have installed the app and have launched it for the first time. If not, you can invite them by clicking on the action button in the bottom right corner, and selecting "Invite". 2) Click on the action button in the lower right corner and select "Request locations"
2) Select the contacts you want to request locations from, then hit the button in the lower right corner. 4) You can follow the results of your request on the bar at the bottom of the screen. 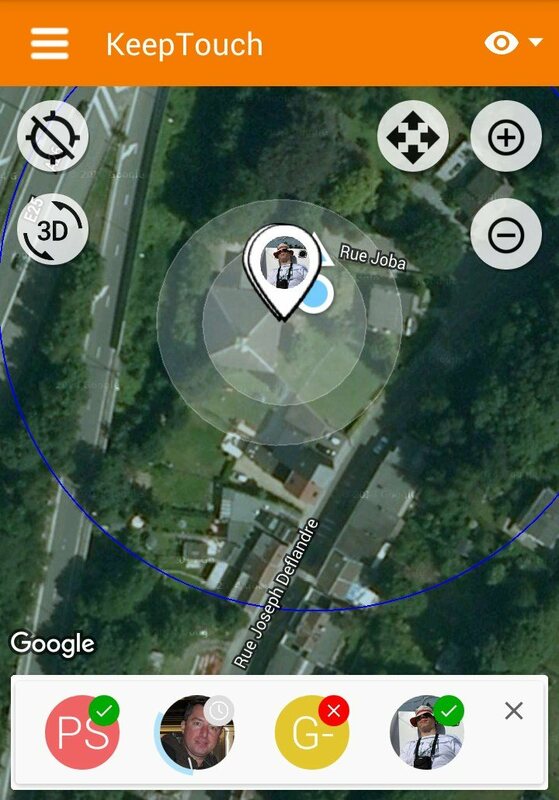 5) To zoom in on the location of one of your contacts and obtain more info, hit the corresponding circle. 6) You can then calculate a Google Maps route to the location of your contact, call them, or make a new location request.